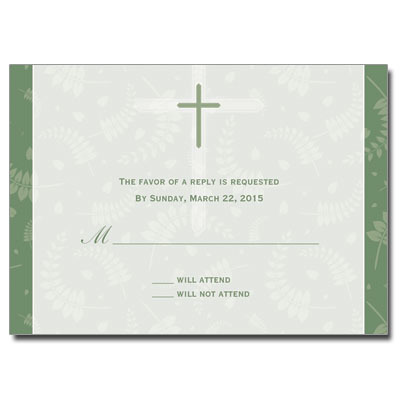 Gather your friends and family members together to celebrate this special occasion in style with these modern Christening response cards. A glowing cross lies on a bed of delicate leaves, symbolizing Spring and new beginnings. We are the experts on personalized christening invitations & party supplies. Create custom baby christening invitations, thank you notes, response cards, & bookmark keepsakes to celebrate this special day. Every product found on ChristeningCards.net is professionally produced by the world-class leader in personalized print, DME. Add your own photo to our invitations & keepsakes to make any card instantly more unique. Our invitation styles range from modern to traditional, elegant to unique. We offer discount cards, handmade cards, & everything in between. You can even buy our invitations blank. Come see why our christening supplies are considered the best value in the entire industry. Thanks for shopping at ChristeningCards.net.